Sub: Interactive Session and workshop on AEO to be held at NACIN, Bhandup-reg. 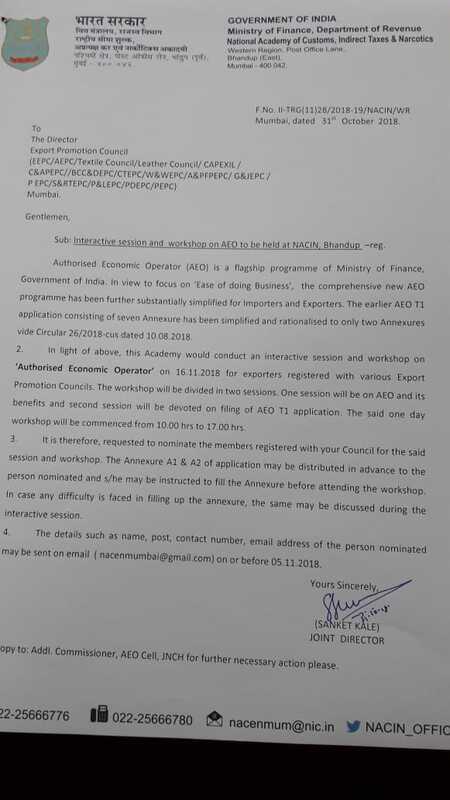 We would like to inform that Ministry of Finance, Government of India is organising workshop on Authorised Economic Operator (AEO) at Bhandup, Mumbai, on 16th November 2018 for exporters. The main focus of the interactive session is "Ease of doing business". The earlier AEO T1 application consisting of seven Annexure has been simplified and rationalized to only two Annexures vide circular 26/2018 customs dated 10th August 2018. We request our members to participate in this workshop and take the benefits. The members-exporters can registered themselves by send the details such as name, post, contact number, email address to nacenmumbai@gmail.com and copy to romumbai@pharmexcil.com before 13th November 2018. We are enclosing herewith the letter received from Ministry of Finance, Government of India along with circular 26/2018 customs dated 10th August 2018 for information.